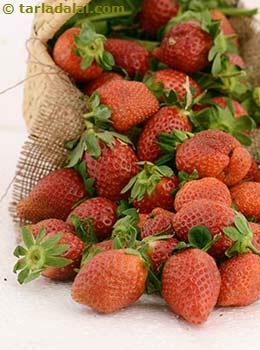 The glycemic index of strawberry is 41 which classifies this red colored, mouthwatering berries under low GI category. Not only is it loaded with antioxidant but also its high fiber and vitamin C content makes it a wholesome nutritious fruit. The glycemic load of strawberry is 4 on consuming ½ cup of strawberry (6 to 7 pc), giving you about 44 calories making it a low calorie fruit. Is Strawberry Safe for Diabetics? Strawberries are without a doubt very beneficial for a diabetic to have as it is very low in glycemic index because it won’t raise your blood sugar levels immediately. Is Strawberry Suitable for Weight Loss? Considering the high fiber content of strawberries, it improves your digestion which ultimately helps in losing weight. This low calorie fruit with a delicious taste makes it a perfect option to dwell on as a snack when hungry. It is advised to avoid strawberries as a dessert which will eventually increase the calories.